If you know what Telltale Adventures are you'll be familiar with what this is: it's basically a cinematic, cut-down version of the point 'n' click adventures of yesteryear. You could even call it a big budget, animated, visual novel and you wouldn't be too far off. Tales from the Borderlands is the fourth of this "new" generation of Telltale adventures after The Walking Dead (2012), The Wolf Among Us (2013) and The Walking Dead: Season Two (2013). Unlike the previous games that are based off comic books, Tales from the Borderlands is based off the popular video game franchise by Gearbox Software and is set after the events in Borderlands 2. In the game, you play the role of two characters: Rhys, an ambitious Hyperion employee that's hoping to work his way up the corporate ladder to become CEO of the company, and Fiona, a Pandoran grifter looking to swindle a huge sum of money in exchange for what seems like a priceless artefact. Most of the game is told in the form of a flashback from either Rhys or Fiona's viewpoints (until you get to the final episode). I actually got this game on the 1 Jan 2017 for $6.24 – so I'm guessing I managed to get it during a Steam sale for 75% off. It's been on sale a couple of times and I guess each sale was slowly chipping away at my willpower until there was nothing left to do but buy it. I got the game because I'm a fan of adventure games in general and I've more-or-less enjoyed Telltale adventure games up to this point (such as Tales of Monkey Island, Back to the Future, The Walking Dead and The Wolf Among Us). Yes, there's still plenty of violence and gross-out moments like previous Telltale games (The Walking Dead and even The Wolf Among Us come to mind) but ultimately, this is a feel-good story which is a welcome surprise for a recent Telltale adventure ("recent" as in, a Telltale adventure released in the past few years). For those who are veterans to Telltale adventure games, you should be pleased to know that it's about two hours per episode meaning the entire game is about 10 hours duration (which is the minimum you'd expect, if you're worried about that kind of stuff). Hiiiiighway to the DANGER ZONE! There are pop culture references galore in this game including ones from Street Fighter, Top Gun, Terminator 2 and Cowboy Bebop - and those are just the ones I recognised (there are probably many more). I laughed out loud several times while playing this game which is exactly what you want to happen when playing a comedy game; one of the highlights though would have to be the "gunfight" on Helios space station (I can't say any more suffice to say, it's hilarious). 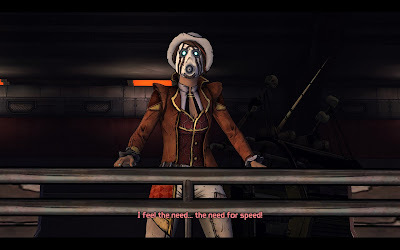 Not content to just have a myriad of pop culture references and genuinely funny scenes, the game also has many cameos from the other Borderlands games – and me saying that, is saying something because I only ever completed the first Borderlands game and played a bit of Borderlands: The Pre-Sequel. You're bound to find a few of your favourite characters making a reappearance. Telltale Games has nailed the art style even to the point that in-game system GUIs look like they're straight from the action RPGs complete with amusing stats for all the items you scan. 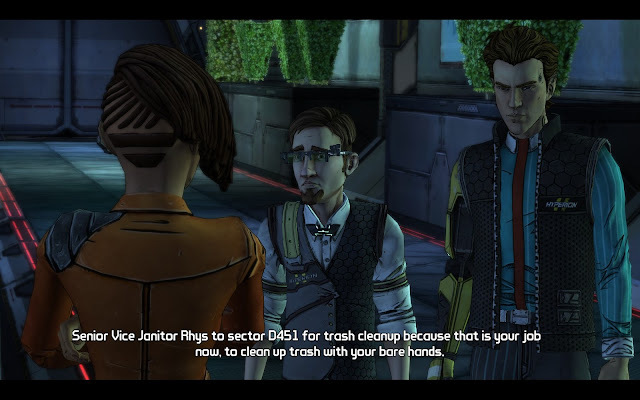 I'm a big fan of this trope, where the narrator embellishes their story with incredulous events or provides their own slant on relationships they've observed; in Tales from the Borderlands, this translates into the scenes actually playing out differently depending on whether Rhys or Fiona is narrating the story. Jared Emerson-Johnson does a fantastic job in not only picking some sweet licensed music to hear during the intros and credits rolls (I especially like Jungle's "Busy Earnin'") but he's no slouch himself when it comes to the in-game music; the orchestral version of the main menu theme definitely gets you in the mood for exploration and adventure on the hostile world of Pandora. As usual for a Telltale adventure game, there are many professional voice actors lending their talents including Troy Baker (as Rhys), Laura Bailey (as Fiona), Chris Hardwick (as Vaughn), Erin Yvette (as Sasha), Patrick Warburton (as Vasquez) and Nolan North (as August). There are 35 Steam achievements to earn and in typical Telltale fashion, they're extremely easy to get (just finish the game and you'll get 100%. 2EZ!). No Steam Trading cards I'm afraid. 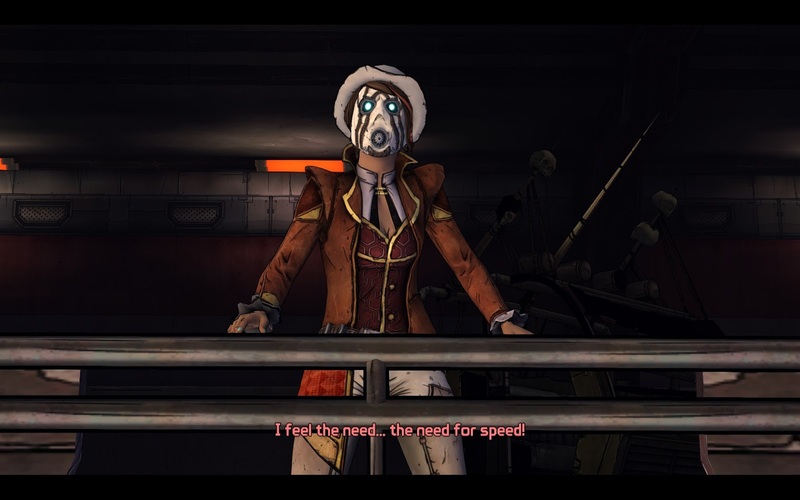 Telltale Games are apparently infamous for this and I'm sad to say nothing's changed with respect to this complaint in Tales from the Borderlands; in every episode, there was at least one particularly bad instance of framerate drops along with several minor graphical glitches to go along with it. There were a couple of moments where I was wondering how on Pandora I ended up in the situation or why nobody seemed surprised when a particular character returned who was presumed dead earlier in the episode. I tried playing this game with a Logitech F710 which is a controller supported by the Steam Link yet it doesn't seem to work with this game. There goes any hope of playing a Telltale adventure on the couch ☹. I haven't played a Telltale adventure this funny since Tales of Monkey Island and I've only ever finished the first Borderlands too! 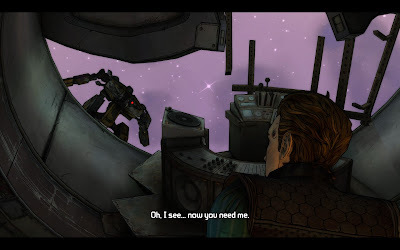 If you want a humourous adventure filled with pop culture references, Borderlands cameos, strong voice acting along with a groovy soundtrack to boot, you'll find it all here in Tales from the Borderlands. The game does have moments where the animation is choppy (something that Telltale has become infamous for), some scenes appear to be rushed and the damn thing doesn't work on my Logitech F710 controller for some reason (even though it claims “Full Controller Support") but I'm willing to overlook these flaws and recommend the game anyway. Especially recommended if you're a Borderlands fan. Is the game worth $24.99 USD? : Yes, but only just; that's about $32 AUD with current exchange rates. I'd recommend waiting until the game goes on sale (or gets included again as part of a Telltale Humble Bundle :)).